There is a universal law in the life of a trader known as the Gangplank Principal whereby the moment you step away from your screens to board a plane, train, or automobile the market will move big. I was traveling from Wednesday thru Tuesday and the market sure did move. I warned last week that they were coming for stops. The market has been looking for a reason to sell and used the weak nonfarm payrolls as an excuse. There’s a chance that we have entered a multi-month indecision stage. How that indecision resolves is unknown at this point. We could be early in a topping process or simply consolidating before going higher. I don’t expect the broad market to move much higher percentage-wise in the near term but I doubt we crash from here either. It’s important to remember that if you’re reading this post you’re on the front line of market sensitivity and awareness. Make sure you’re matching your trading timeframe to your analysis. If you’re a long-term trader or investor try not to focus on microscopic patterns, intermediate trendline breaks, or knee-jerk sentiment. If we are topping we likely haven’t seen the highs before we take the big tumble. These things take time. Most long-term indicators are still healthy. One that looks troubling is the increasing spread between junk and high-grade credit. My outlook is essentially neutral to bullish at this point and if my indicators start turning bearish I will get more defensive. If the market continues to run higher in the face of deteriorating indicators I will get outright bearish. For now, $SPX 1340 looks like a decent line in the sand for longs. Here is a quick scan I did for market moves that display a loosely similar price signature to the one we’ve recently experienced. 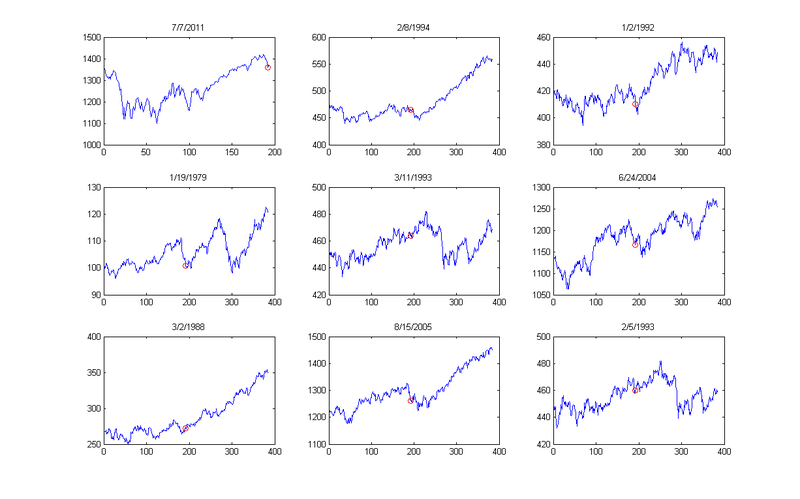 Interpret this anyway you like, but note the distinct absence of market crashes in the next 50 sessions. Warning: go through these patterns carefully because not all of them match on closer inspection. I personally like 2005, 2006, and 2010/11 (not shown).